Jasmine essential oil is among the natural oils with the most delicate, rich and very beautiful sweet floral aroma, that makes it a valuable ingredient for many cosmetic products. 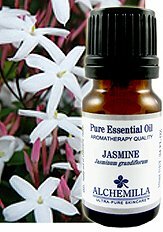 Jasmine is one of the oldest known and used botanical scents. Jasmine essential oil is produced not by steam distillation but rather by solvent extraction. In the Middle Ages jasmine was growing mostly in China, North India and North Africa, and in the 17th century jasmine oil was introduced to Europe. The word “Jasmine” has Persian origins, and Asian nationalities used jasmine branches with gorgeous white blossoms for their various ceremonies and rituals. In early times, in Egypt, China, Morocco and the Osman Empire jasmine flowers were used for producing flavored tea, and jasmine oil was primarily valued for its excellent aphrodisiac properties. Also, jasmine oil has been known as the oil for women as it has the properties to balance hormones, relieve menstrual pains and cramps, as well as relieve the pains while giving birth. 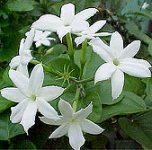 Emotional and physical benefits of jasmine essential oil are numerous. In the context of aromatherapy it is known as a powerful sedative and relaxant, which warms and induces sleep. This oil is one of the most common ones for meditation, stimulating the feeling of harmony and optimism, inducing joy and happiness, etc. Also, jasmine essential oil is used for its antidepressant and uplifting properties, and it is the most effective for those who suffer from chronic fatigue symptom, nervous exhaustion, apathy, low spirit, mood swings and so on. Also, benefits of jasmine essential oil include analgesic, carminative, antiseptic, anti-inflammatory and other properties of this natural product. It is an excellent urinary tonic and a great tonic for greasy, dry, oily, sensitive and irritated skin. It can be effectively used to treat scratches, scars, stretchmarks and other skin imperfections, as well as assist in relieving muscle pains, swellings, stiffness, sprains, etc. Finally, it is beneficial for those who suffer from various respiratory problems, including sore throat, laryngitis, coughs and so on. Jasmine oil can be blended with all other oils, but it goes especially well with sandalwood, orange, vetiver, melissa and rose oils.